Cross the International Date Line, an imaginary line on the surface of the Earth that runs from the North to the South Pole – and defines one calendar day from the next. Crossing the International Date Line adds one day (24-hours) traveling west, and subtracts one day (24-hours) traveling east. On arrival into Auckland, you will be met and transferred to your accommodation, or if you choose the rental car option, you will pick up your vehicle and self-drive to your hotel. Depart Auckland on board a motor coach for your ride south to Hamilton. Travel through the rich Waikato area, famous for its dairy farms, kiwi fruit orchards, thoroughbred horses…..and the Waitomo Caves! You will enter subterranean limestone caverns to view the Glow Worm Grotto; surely one of the wonders of the world. Then continue over the bush clad Mamaku Ranges to Rotorua. En route to the Marae, the guide explains the protocol to take place. The group on board is prepared for the wero (challenge) and welcome to the Marae. Upon entering the exquisitely carved meeting house, you will hongi (greet – pressing of noses) with your host. The tradition means you are a friend and may consider yourself one of the family. Now sit back and enjoy the culture of the Maori people. See the fierce Haka (war dance), twirling of poi balls, stick games and other entertainment. See the highlights of Rotorua – this tour shows you the best of Rotorua’s natural and man-made attractions. Your half-day tour includes a visit to Rainbow Springs and Rainbow Farm for a sheep show and working sheep dog demonstrations. Continue to Whakarewarewa Thermal Reserve to see bubbling mud pools, steaming geysers and intricate Maori wood carvings. Depart Rotorua and travel south to Napier. Far from the world’s great population centers and from the European and American cities where 20th Century design evolved lies a small city that is unique. Napier was rebuilt in the early 1930s following a massive Richter 7.8 Earthquake. Subsequent fires destroyed most of its commercial heart. By the end of the decade, Napier was the newest city on the globe. Enhanced by palms and the angular Norfolk Island pines which are its trademark, and bounded by fertile fruit and grape growing plains, dramatic hills and the shores of the South Pacific, beautiful Napier is the centre of the Hawke’s Bay region. In Napier, you can enjoy the legacy of its brave rebuilding and savor the spirit of the optimistic Art Deco era. If you choose the self-drive option, you will drive from Rotorua to Napier at your own pace. Depart Napier as you continue heading south toward New Zealand’s capital city – Wellington. New Zealand’s capital is renowned for its superior shopping, theaters, cafés, vibrant nightlife and its strong association with the arts. The Wellington region of the lower North Island, which includes Wellington City, the Wairarapa, Hutt valley, Porirua and the Kapiti Coast, is a vibrant new visitor destination. It is a gateway to New Zealand’s culture, both urban and rural. If you choose the self drive option, you will drive from Napier to Wellington at your own pace. Features of your tour with Great Sights include Parliament buildings, Old St. Paul’s Cathedral, Lady Norsewood Rose Gardens, National Art Gallery and museum, Oriental Bay, Wellington Harbour and Marine Drive. Tour duration is around two hours. Transfer to the Wellington ferry terminal before taking the Interislander ferry from Wellington to Picton. The 50 mile journey takes little more than three hours, yet it’s one of the world’s great scenic cruises. And when you cruise across on the Inter-Islander you’ll find a wonderful combination of entertainment and services that will make your Cook Strait crossing even more memorable. On arrival into Picton, board the coach for your journey to Nelson. If you choose the self-drive option, collect your vehicle at the ferry terminal and enjoy the drive directly across the Richmond Range as you head towards Nelson. Approximate time to allow is 2 hours for this drive. The beach, shining sea, cozy cafés, forest walks, beautiful landscapes, sun and blue skies, a thoroughly relaxed lifestyle, the artists attracted for the same reasons, their amazing art, the seafood, the wine, boutique breweries… this is Nelson. Explore the surrounding area on your own or on one of our additional day excursions. A point-to-point coach service will transport you from Nelson to Greymouth. On arrival connect with another coach for the journey to Franz Josef. If you choose the self-drive option, you will drive from Nelson to Franz Josef at your own pace. Set between the stormy expanse of the Tasman Sea and the unbroken chain of the Southern Alps, the West Coast of the South Island of New Zealand is truly a land apart. For six hundred kilometers from north to south, this wild and often sparsely-populated region of mountains and glaciers, of lakes and unruly rivers, of primeval forest and magnificent coastline, overwhelms visitors with its natural beauty. Opportunities on the West Coast are now virtually endless for activities like beach and forest walking, tramping, fishing, horse-trekking, canoeing, exploring old gold mining regions or ghost towns abandoned in the wake of the gold rush era. 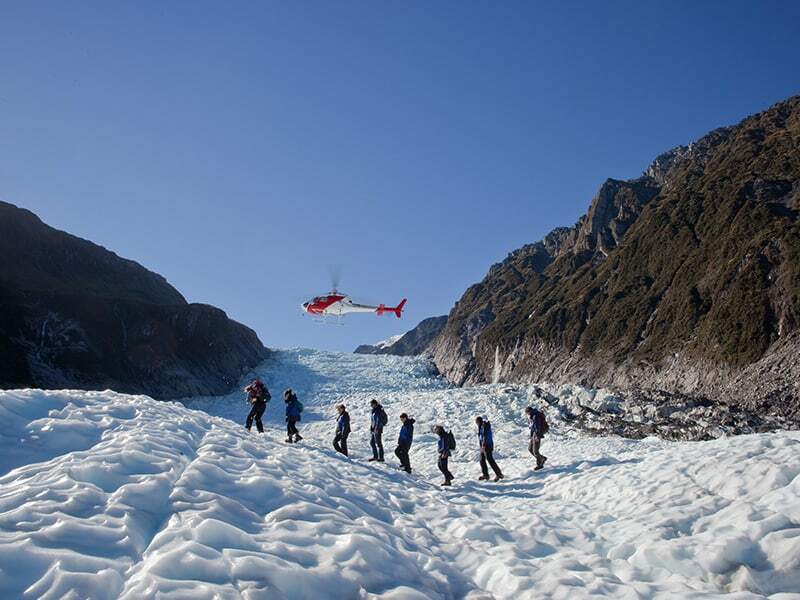 Today you will enjoy Franz Josef Glacier at its most dynamic! The Glacier Valley Walk takes participants alongside the mighty Waiho River bed following the glaciers path of retreat in this remarkable landscape. Here, learn about the glacier’s history, see what is left behind by this majestic giant, and learn the legend of Ka_ Roimata o Hinehukatere. Near the terminal face, cross over the public barriers, and after a brief climb, will be rewarded with spectacular views of the rapidly changing terminal face of the glacier. There has never been a more extraordinary time to visit Franz Josef Glacier. Depart the glacier region of Franz Josef and continue south by motor coach to New Zealand’s adventure capital – Queenstown. If you choose the self-drive option, you will drive from Franz Josef to Queenstown at your own pace. At your leisure to explore the adventure capital of New Zealand. Set between the towering Remarkable Ranges and the bottomless Lake Wakitipu, Queenstown has it all – bungee jumping, jet boating, rafting, amazing scenic helicopter flights. You may wish to visit Milford or Doubtful Sound or the old gold mining town of Arrowtown. Depart Queenstown to travel by coach to Pukerangi then take a mesmerizing train ride from Pukerangi to Duneidn. You travel through Central Otago with its bizarre schist rock tors, desert landscapes, blue lakes and river gorges. See spectacular changes in scenery, from the rugged mountain gorges of the Taieri River to fertile plains. The trip crosses giant stone and wrought iron viaducts and enters numerous tunnels carved from rock – arriving into Dunedin early evening. If you choose the self-drive option, you will drive from Queenstown to Dunedin at your own pace. A university city of Scottish heritage, Dunedin possesses a unique combination of cultural riches, fine architecture, and world-famous wildlife reserves. The sheer physical beauty of Dunedin’s dramatic bush-covered hills and valleys at the head of a long natural harbor attracted Maori settlers to the site over four centuries ago. Then, in 1848, Scottish migrants established a town here, giving it the ancient name of Edinburgh. Soaring cathedral spires, a magnificent Flemish-style railway station, fine banks and office blocks, a nineteenth-century castle, old university buildings and a neo-gothic convent are among the city’s architectural treasures. Dunedin’s art gallery and museums contain some of the best collections in New Zealand. And within the city boundaries are internationally renowned wildlife reserves including a rare Albatross breeding ground and Yellow-Eyed Penguin colonies. Dunedin welcomes its visitors with traditional Scots hospitality handed down from the city’s founding fathers, who in 1848 settled in the hills at the head of the fjord-like Otago Harbour. Depart Dunedin and head north to Christchurch. Christchurch is the South Island’s largest city, beautifully encapsulates the best of what New Zealand has to offer. This is a vibrant city of exciting festivals, art galleries, theaters and great shopping. Award-winning attractions are available within the city and the surrounding countryside. Find out what variety really means; explore our unspoiled corner of the globe, where wilderness, adventure and sophisticated urban living can be found in perfect balance. If you choose the self-drive option, you will drive from Dunedin to Christchurch at your own pace. Transfer to the airport for your departure flights.